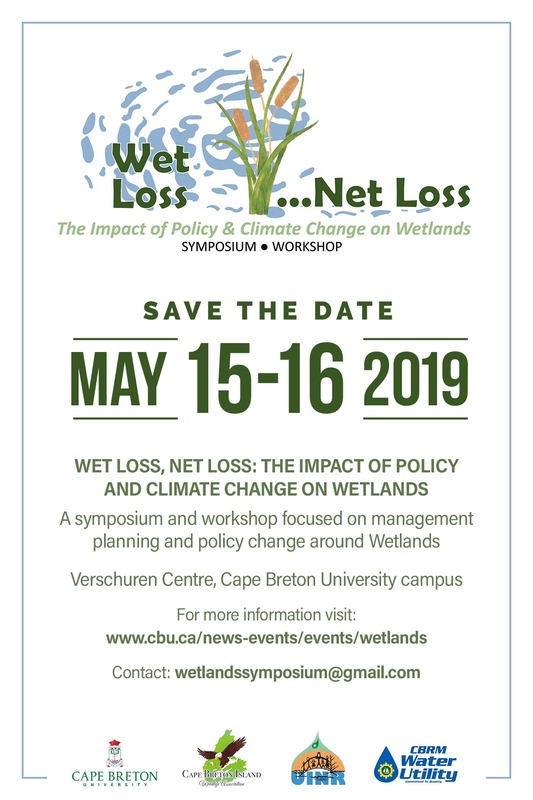 Cape Breton University, in partnership with the Cape Breton Island Wildlife Association, CBRM Water Utility and the Unama’ki Institute of Natural Resources (UNIR) will be hosting “Wet Loss, Net Loss: The Impact of Policy and Climate Change on Wetlands”. A Symposium and Workshop focused on Management Planning and Policy Change around Wetlands. Wednesday May 15th, 2019: The Symposium: This event is free and open to the public, but registration is required (registration details to follow). This all-day symposium will inform and educate you about wetlands and bring attention to emerging issues unique to Cape Breton Island/Unama’ki, and within the context of climate change. Details including guest speakers and schedule of events will be made available shortly. Thursday May 16th, 2019: The Workshop: This event is by invitation only and will help identify emerging issues of policy implementation, using Cape Breton Island/Unama’ki as a case study. Participants with expertise in relevant disciplines will have the opportunity to contribute to the evaluation of wetland policy and practice for addressing current and future wetland loss issues in Cape Breton.